“Fibre” redirects here. 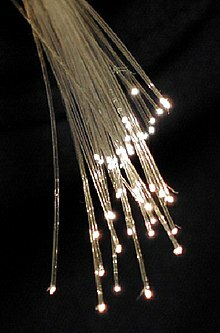 For other uses, see Fiber (disambiguation). Mineral fibers include the asbestos group. Asbestos is the only naturally occurring long mineral fiber. Six minerals have been classified as “asbestos” including chrysotile of the serpentine class and those belonging to the amphibole class: amosite, crocidolite, tremolite, anthophyllite and actinolite. Short, fiber-like minerals include wollastonite and palygorskite. Metallic fibers can be drawn from ductile metals such as copper, gold or silver and extruded or deposited from more brittle ones, such as nickel, aluminum or iron. See also Stainless steel fibers. ^ Harper, Douglas. “fiber”. Online Etymology Dictionary. ^ “man-made fibre”. Encyclopædia Britannica. Encyclopædia Britannica, Inc. 2013. ^ Kauffman, George B. (1993). “Rayon: the first semi-synthetic fiber product”. Journal of Chemical Education. 70 (11): 887. Bibcode:1993JChEd..70..887K. doi:10.1021/ed070p887. ^ “synthetic fibre”. Encyclopædia Britannica. Encyclopædia Britannica, Inc. 2013. ^ Serope Kalpakjian, Steven R Schmid. “Manufacturing Engineering and Technology”. International edition. 4th Ed. Prentice Hall, Inc. 2001. ISBN 0-13-017440-8. ^ James Edward Gordon; Philip Ball (2006). The new science of strong materials, or, Why you don’t fall through the floor. Princeton University Press. ISBN 978-0-691-12548-0. Retrieved 28 October 2011. ^ Design and Control of Concrete Mixtures”. Sixteenth Edition. United States of America: Portland Cement Association. 2018. pp. 237–247. ISBN 978-0-89312-277-5. ^ a b “Polymer Properties – Omexus by Special Chem”. ^ a b “Sisal Fiber – World of Sisal”. ^ Narayanan, Venkateshwaran (2012). “Mechanical and Water Absorption Properties of Woven Jute/Banana Hybrid Composites”. Fibers and Polymers. Vol.13, No.7,907-914. ^ a b K. Murali Mohan, Rao (2007). “Tensile Properties of Elephant grass fiber reinforced polymer Composites”. Journal of Materials Science. Vol.42, Issue 9,3266-3272. ^ a b “Metallic Materials –TEADIT” (PDF). ^ “Carbon Fiber – Americans Elements”.